Hit the “Random” button and see what comes up! In this feature, we take a look at whatever manga the RNG decides to throw at us and find out if it’s worth your time. Iro’s on vacation this weekend, so he pushed the responsibility of RMT onto our newcomer EuricaeriS! I am one incredibly lazy individual. I guess it might not seem that way to a lot of people because there’s always a lot going on, but if I could get away with it, I’d love nothing more than to just sleep all day and order in food for maximum energy conservation. The life of the NEET (Not in Employment, Education or Training) is oh so appealing to me, but sadly there are a lot of things in the real world that make it hard to…survive like that. At least, I’m pretty sure that if I decided to chuck everything in and live at my mum’s place, I’d quickly be marched into a job centre. Sora no Shita Yane no Naka focuses on Sasagawa Kanae, a NEET with almost zero motivation to escape her current situation beyond being guilt tripped by her mother. For the most part, we’re given a glimpse into her life in traditional 4-koma style, where each day presents its own challenge as she slowly but surely comes to terms with the need to get a job. A lot of the early manga is dedicated to her lazier days, allowing herself day-long breaks for successfully completing a menial task that is loosely related to the job hunt. We also get to meet a few of her friends from school, so it’s not all about her rolling about in bed. While there are plenty of funny quips and scenarios packed into these panels, it’s unfortunately not going to have you reeling with laughter. That’s not to say it’s bad either, but it does make this a far more casual read as a consequence. What happens in the manga isn’t so incredibly interesting that you’ll be turning pages with bated breath, but the allure of Kanae as a character is strong enough to pull you in. Her strange antics and her negative views on working life are rather entertaining, and even when you’ve had enough of that, there’s her crossword-loving mum and a few employed friends to make her a little embarrassed over her NEET status. I suppose my biggest complaint is that the manga feels quite restrained. It doesn’t ever go near the levels of insanity that Welcome to the NHK boasts, and it isn’t forcing laughs as frequently as I’d have liked. That said, it does have a Hidamari Sketch vibe to it, so if you enjoy a slow-paced slice-of-life, this might be right up your alley. 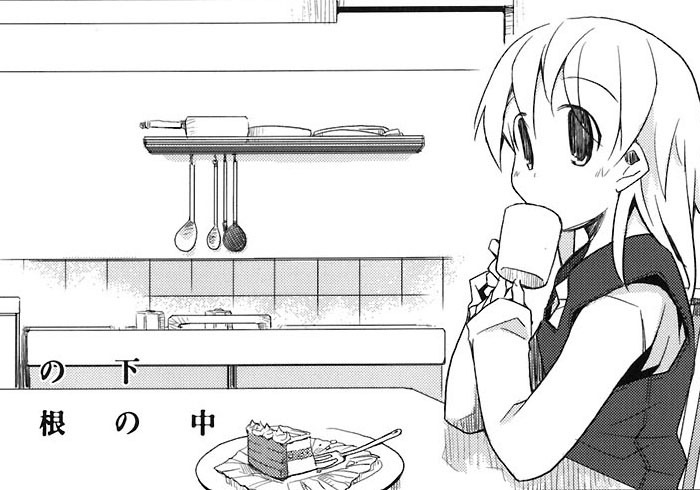 In fact, Kanae is quite similar to Hidamari‘s Miyako, if you swap the obsession with food for a fear of being employed. Okay, perhaps they’re not so similar, I’m going to continue pretending this is a Miyako side-story because it’s more fun that way. Sora no Shita Yane no Naka is enjoyable, but I can’t help but wonder what it could have been like if it had committed to the crazy-route, or delivered consistently on the comedy-route. Like the NEET it portrays, this manga needs to work up the courage to come out of its shell and really let loose. Definitely worth a read if you’re looking for something new, but don’t expect to be adding it to your list of all-time favourites.